Send perfect get well gifts that are thoughtful and will remembered forever in the recipientís heart. Adorable Gift Baskets offers get well gift baskets with meaning; gifts that reflect your message of well wishes, care, and concern. Popular get well gifts include a flower bouquet with your warm message, get well gift baskets containing doctor theme gift items, breakfast in bed gift trays filled with coffee, pancakes and breakfast food, get well cookies, fruit baskets and gifts of tasty gourmet food, pampering bath and body gifts, spa baskets with scented candles and much more. Sadly, sometimes we find our loved ones in ill health, requiring medical attention. It is in times like these that the perfect get well soon message is needed. A message that not only wishes them a speedy recovery but warms their heart, letting them know that they are not alone. The aim of such messages is to arm those we care about with hope when they really need it- hope that is underestimated all too often- and to reassure them of our love and support. Before writing your get well soon message, it is important to try to imagine the mindset and emotional state of the receiver. Perhaps they have just received some bad news, or they are feeling lonely in a hospital bed surrounded by strangers. This will help you to tailor your words to their emotional needs and comfort. Considering that get well soon messages are informal, it is important to use the recipientís first name. This adds a personal feel to you words right from the beginning. I am sorry to hear that you are unwell. We all miss you! Things here are just not the same without you. For the main body of your message, show the person exactly how much they mean to you and mention that you are thinking of them and, perhaps, praying for their speedy recovery. A personal touch, that always works well, is to recall a previous situation that you know will put a smile on their face. This will work to cheer your friend or loved one up and distract them from their illness. I hope you get well very soon! I canít wait to see you fit and well again. Always keep the aim of your message in mind. It may help to imagine your friend or loved oneís face expression when reading what you are writing for them. With this in mind, it is no doubt clear that you must be positive. Your positivity will encourage them to fell better within themselves regardless of their physical condition. 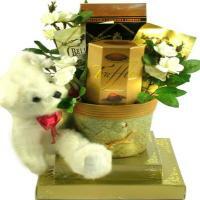 Adorable Gift Baskets we specialize in cheerful, uplifting get well gift baskets and gifts. 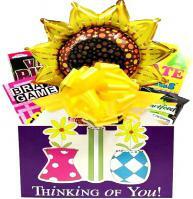 Choose from a huge variety of get well gift baskets designed to brighten the day. Popular get well gifts include fresh fruit, bath and body gifts, book gift baskets, tasty food snacks and more. 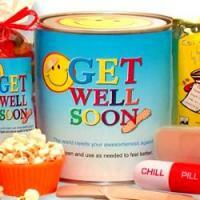 Send an encouraging get well gift basket to an ill friend today. 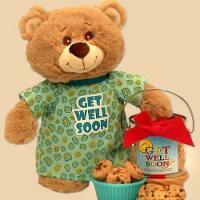 When you want to share your thoughtfulness with a sick loved one, Adorable Gift Baskets has just the right get well gift baskets to make them smile. Whether your loved one is suffering from a long-term illness such as cancer or has recently undergone surgery, a get well basket can help cheer them and show them you care. Perhaps you have a co-worker that's been out of work due to sickness, or maybe you own a company and want to express your wishes to employees while they're out of work on sick leave. A get well gift basket from Adorable Gift Baskets can be hand-delivered to their door or even to the hospital. Get well gift baskets are not only thoughtful, they're also practical for every need. You can pick and choose which get well basket will be appropriate for the occasion. If your loved one is too sick to eat anything, try baskets with floral arrangements or plants. At Adorable Gift Baskets, you'll find distinctive gifts such as green garden plant arrangements, mixed African violet flowers, a Victorian teapot bouquet, and many other beautiful gifts. You can also send one of our inspirational gift baskets for a sick loved one or bath and body relaxation baskets to enhance the healing process. Help them bust boredom while on a long hospital stay with a basket full of small games (chess, checkers, dominoes, etc.) and puzzle books. Comfort your sick loved one with a prayerful basket from Adorable Gift Baskets containing a serenity prayer book and soothing herbal tea. Or, warm their heart (and their tummy) with a chicken noodle soup get well basket. Food get well gift baskets offer a variety of treats such as gourmet foods, chocolates, cookies, candies, coffee, tea, fruit, nuts, and many others. 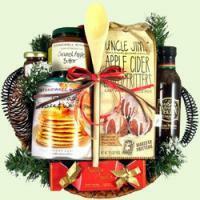 Adorable Gift Baskets also features healthy snack get well baskets and sugar-free get well gifts for the diabetic. With a value-packed get well gift basket from Adorable Gift Baskets, you're sure to surprise your loved one and help them to a speedy recovery. It's just what the doctor ordered!